Xenon FF Prime Cash Back Promotion Autumn 2016! Purchase of 3 - 4 lenses - 10% discount plus blue flight case for free (Voucher code: SK-FFP-10). Purchase of 5 or more lenses - 15% discount plus two blue flight cases for free (Voucher code: SK-FFP-15). Valid till December 15, 2016 and while stocks last! 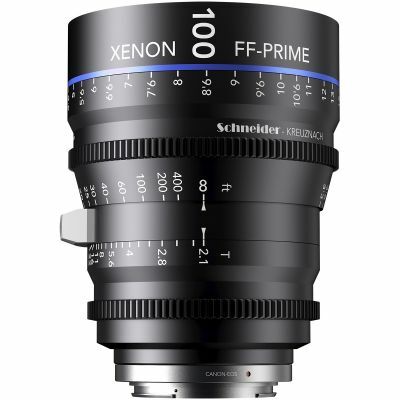 Following with tradition in designing and manufacturing the highest quality, high-definition professional photography lenses, Schneider Kreuznach is proud to embrace the technical developments of modern HDSLR cameras and offer a new range of lenses in this field. The technical advancements on digital camera technology along with the ever increasing pixel count on modern sensors calls for lenses that can meet todays’ challenge for high Resolution capture and perform flawlessly. With long proven expertise in photo optics as a foundation, Schneider Kreuznach now presents the first lenses of a new product family which is specifically designed to meet These specifications.